Everything you see online was first designed digitally and then converted to HTML and CSS code to be viewable on web. And for this, almost every time a graphic design creates the layout and design in Photoshop and then a developer replicates the look on the web. In this particular article, we are covering various UI PSD buttons that you can download and use for personal and commercial purposes.You may also see Multimedia Buttons. The overall design can be of various kinds, ranging from a 3D look to flat buttons. These buttons have been always in use to initiate an action amongst other uses like the submit button that acts as a form element, or media player buttons to toggle and switch between the media contents.You may also see Video Buttons. If you are designing a website in elegant shades of gray then this amazing set will provide you a brilliant collection of buttons, sliders, input elements and pagination that will give your design a very modern and professional look.You may also check PSD Rounded Buttons. 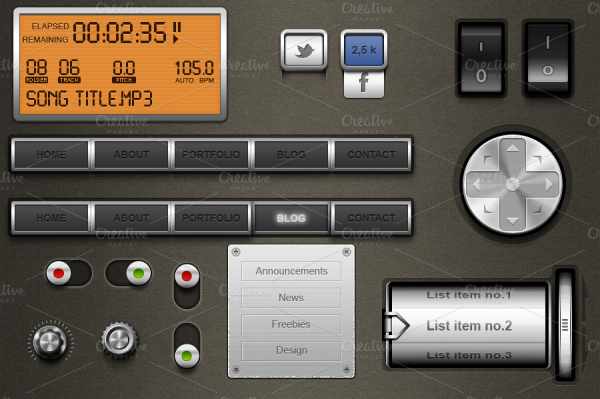 Here is a simple yet cool set of button UI available in a PSD file. The design contains design and layout for just 5 characters and symbols, but it can be edited to suit other characters as well through the editable file. Here is a series of buttons UI by Fabio Benedetti for a new website. The design is in simple gray color with enough detailing to lighting with shadows towards the lower end of the button, giving the visual that light is coming from above. Here is a great collection of a series of flat web button UIs. The designs are fairly simple, yet they will add a lot of value to the overall output. The design is downloadable in a completely organized and layered file for you to edit. 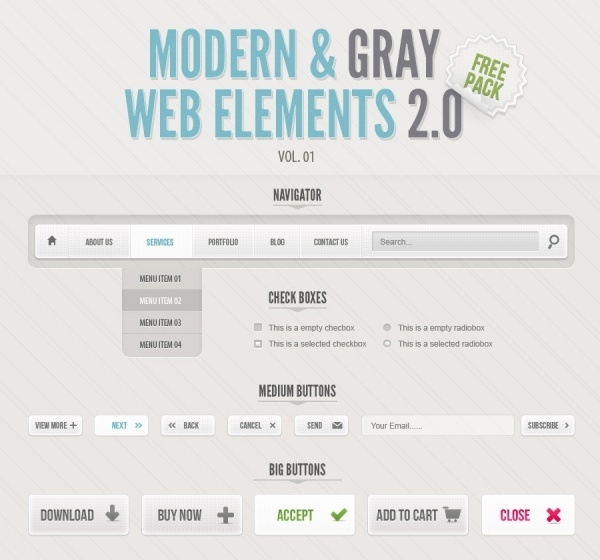 Are you looking for a giant collection of metallic buttons to funk up your web designs? If yes, then here are 20 abstract designs for the buttons which you can download and edit using Illustrator. Here are some amazing button UI designs that you can use as media player buttons in the next design. Again, the detailing is quite professional with the shadows and the overall look. You can download the high-resolution copy of the design from the given link. Here is a brilliant collection of various web elements UI designs which you can download and use to jazz up your design in shades of black and gold. The PSD is completely organized and layered and uses Tahoma typeface throughout the design. 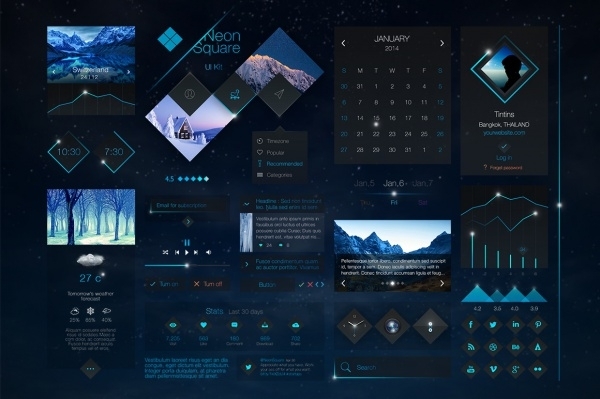 Here is a totally modern, elegant, and breathtaking UI kit for both designers and developers. The kit contains amazing designs with such simplicity that will definitely increase the beauty of your design by multifold. Looking for a little color and aura to your design? Here is a high-resolution set of 36 different colorful web buttons for you to download from ShutterStock. It is important to make sure that there is a copy of the design you are trying to create on the web. In such cases, these PSDs are really useful and keep a track of exactly how the design looks like. You can play around with the design elements, like tinker around with the shape of the designs to create other geometrical buttons. These web buttons are always going to be present in any web design, and the designs for them are becoming more and more intuitive.